As a child I couldn’t stand any vegetables other than potatoes though my parents didn’t give me a choice! At the top of the list were green capsicum, broad beans, and beetroot. As I grow older, my palate has been changing with age, exposure and of course, interesting recipes that makes me look at vegetables I previously wouldn’t touch with a bargepole, in a completely different light. The main change however, came about in university when I finally realised – after falling badly ill – how essential vegetables are on a daily basis for good health. 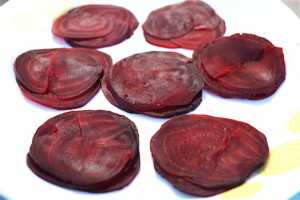 Beetroot has this earthy taste that a lot of people shy away from. However, it’s also packed with nutrients, antioxidants, vitamins and minerals and I realised given the right combination of ingredients, you can completely change the way it tastes and love it. This recipe proves that. I served it at a dinner party and got rave reviews. The trick is to finely slice the beets and the onions and not have large chunks hitting your mouth. 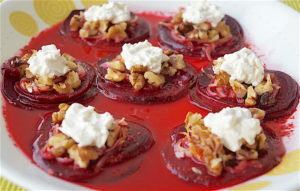 The marinade seeps into the beets and onions, pickling them and the salty feta topping completes the taste. 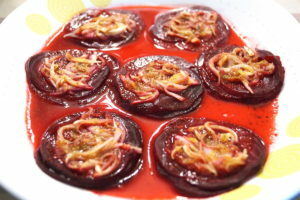 The onions marinating in the dressing will release their juices and that can all be used to top over the beets and after refrigeration you will find the most vibrant red juices covering the plate and colouring the onions. 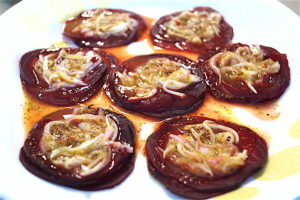 My son, who on any given day doesn’t touch onions and the husband who wouldn’t go near beets went for seconds and a friend at the dinner – who normally doesn’t eat vegetables – complemented the beets at least four times. Must be good then. 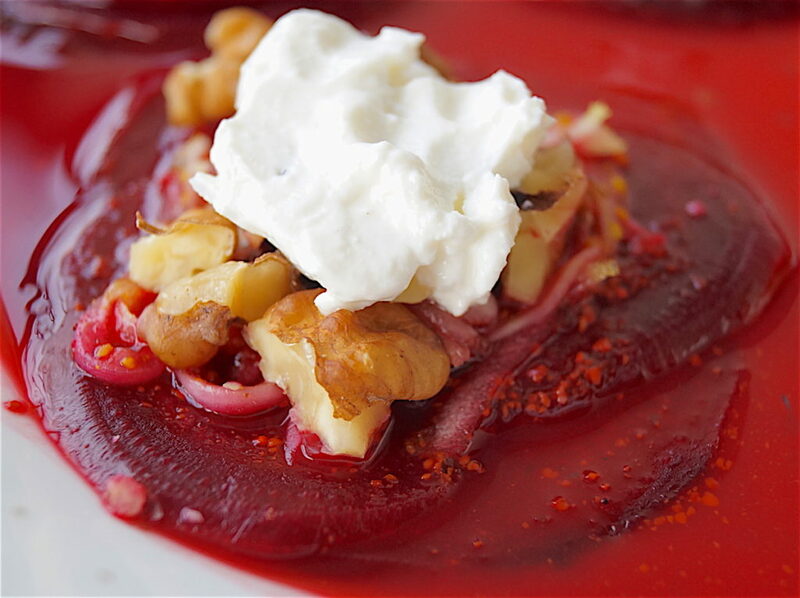 This dish has also given me a whole host of ideas about how to use beets in different dishes and going forward you’re going to see the results of my inspiration. I used Delakis white cheese for the topping. Its a creamy salty cheese thats very similar to feta. 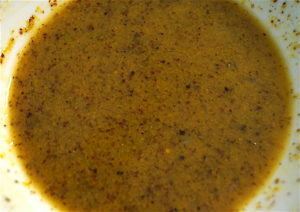 Kasundi is a Bengali mustard preparation which includes mustard seeds ground with a whole bunch of spices and mango, and is a staple in all Bong households. 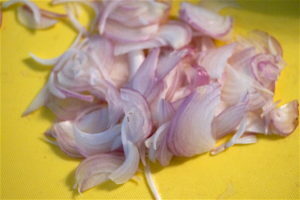 It plays a prominent role in my cooking and is the secret ingredient that gives that added kick to many dishes. I used the Druk brand of Kasundi here. It’s mild and not so pungent. If you do not have access to kasundi, you can use Dijon mustard and if you don’t have access to that either, then use a not-so-pungent English mustard. You may have to tweak the rest of the ingredients then to get the optimum flavour. As you will see below, this dish has absolutely no oil in it. Honey and cheese make up the bulk of the calories but hey, some things cannot be given up. So buy those beetroots and have yourselves a treat. Mix all the ingredients for the dressing well so that all the flavours meld together nicely. Check for seasoning. 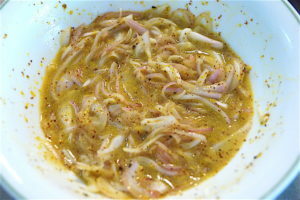 Drop the finely sliced onions in the dressing mix and toss together. Let it sit for at least an hour. 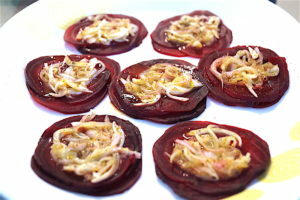 Slice the beetroots into fine disks on a mandoline or if you can, with a knife trying to make sure the slices are more or less the same thickness (or thinness actually). 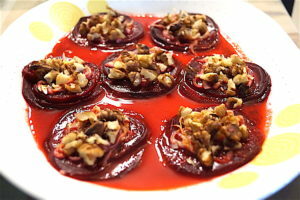 Place four to six slices of beetroot partially on top of each other on a large plate to make one rounded portion and fill up the plate similarly with the rest. Top all the arranged beetroot sections with equal amounts of the marinated onion slices and then pour the remainder of the liquid over the beets. Refrigerate for at least two hours or more or even overnight. 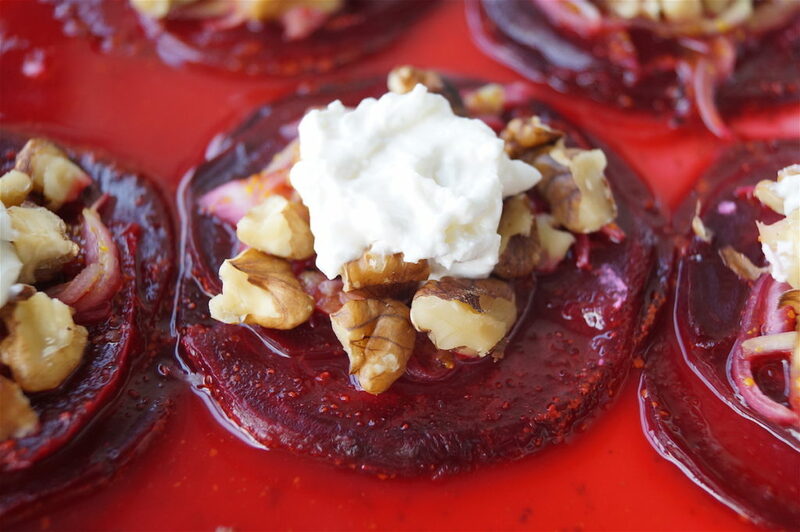 The longer you keep the beets marinating the better it will be. 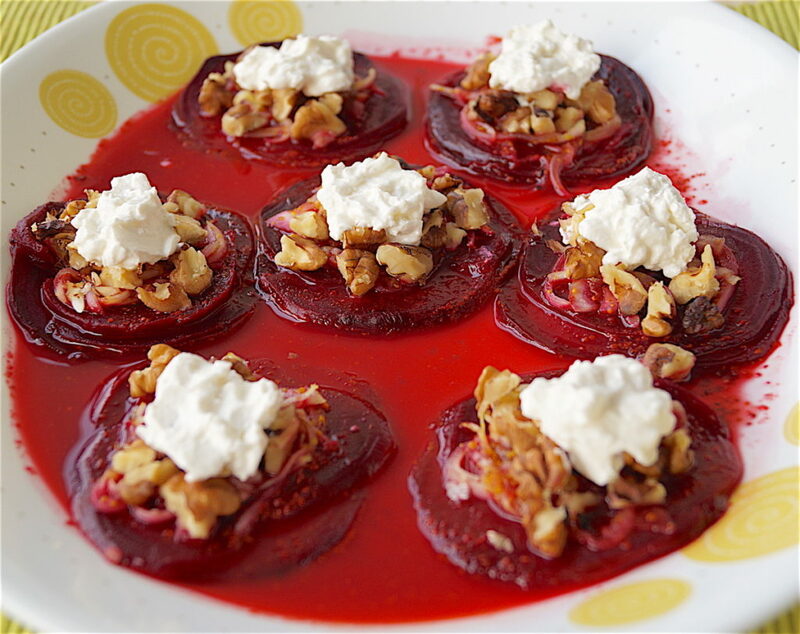 Just before serving, sprinkle the walnuts over each section and top each section with a dollop of feta cheese. 5. Place the onions on the beets.